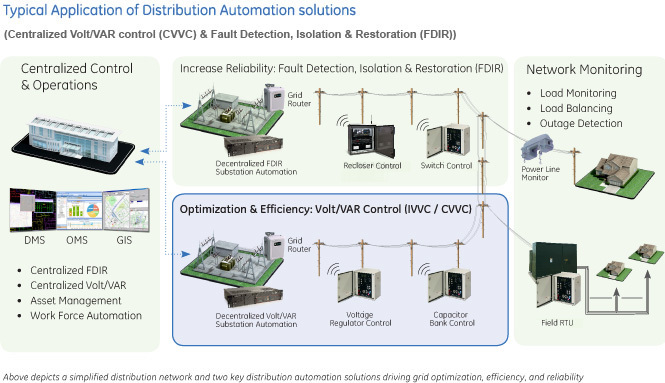 The Multilin DGCC Capacitor Bank Controller enables a utility to optimize operational planning and asset tracking through 3-Phase power quality monitoring, and to reduce system downtime. The Multilin Capacitor Bank Controller is a 3-Phase Capacitor Bank Controller that is compatible with most Capacitor Bank Switches, including Cooper, Joslyn, and Trinetics. Manufacturing for this product has been discontinued. Please contact us if you have any inquiries. Optimize Voltage - through ‘Conservation of Voltage’ that leads to reduced demand, that may result in decreased generation up to 6%. Increased efficiency- through improved power factor and reduced VAR which helps to reduce power line losses. 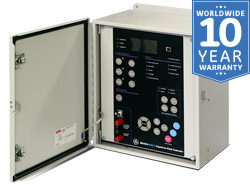 As a complete package, the Multilin Capacitor Bank Controller is offered in a NEMA-4 certified cabinet that is suitable for operation of harsh environments with an operating range of -40°C to + 60°C (-40°F to +140°F). In this mode, it is possible to Open or Close the Capacitor Bank, locally, from the large pushbuttons located on the front panel of the Multilin Capacitor Bank Controller. For increased operational reliability and operator safety, inhibit functions configured in the unit will continue to operate as defined. In this mode, the commands for Open or Close of the Capacitor Bank are received via communication channels from the SCADA or an integrated Volt/VAR system. This communication channel can be provided via optional radio or cellular communications. The Multilin Capacitor Bank Controller includes a Reverse Power Detection function, which defines the minimum pickup required to detect reverse power conditions. In situations where the capacitor bank has been tripped due to a neutral current unbalance situation, the Multilin Capacitor Bank Controller will execute a reclose action to validate the state of the fault, ensuring the fault was not transient in nature. This automatic reclose action ensures maximizes system reliability. The Multilin Capacitor Bank Controller offers powerful I/O and programmable FlexLogic™ options for advanced automation control, reducing the need for additional programmable controllers or discrete control relays. The Multilin Capacitor Bank Controller has three identical set point groups. The activation of the group can be done either from the HMI or via a Digital Input. The Multilin Capacitor Bank Controller has three identical set point groups. The activation of the group can be done either from the HMI or via a Digital Input. Virtual Inputs and Outputs The Multilin Capacitor Bank Controller provides 32 virtual inputs and 32 virtual outputs that provide users the ability to send commands to the device. 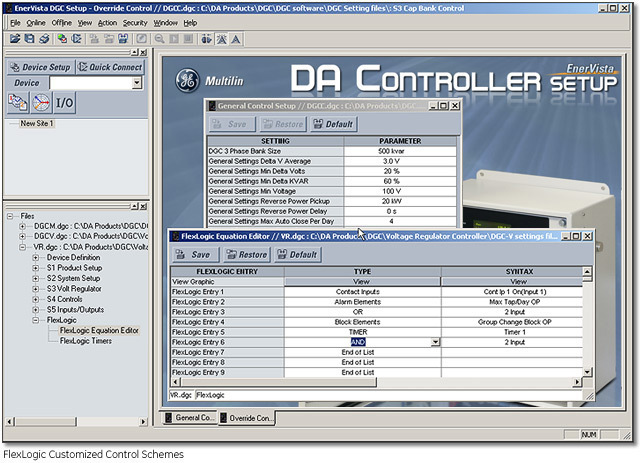 The Multilin Capacitor Bank Controller can accept commands from SCADA, through the front HMI, or front USB port to issue commands such as Open or Close. Command Setting The Multilin Capacitor Bank Controller has the ability to force commands from the menu structure accessible through the Multilin EnerVista setup software that runs on a PC. FlexLogic™ Advanced FlexLogic in the Multilin Capacitor Bank Controller provides the ability to create customized control schemes. This minimizes the need for auxiliary components and wiring, thus reducing complexity and costs. These data points can be easily integrated into a customer’s database for seamless viewing through a SCADA or DMS system. 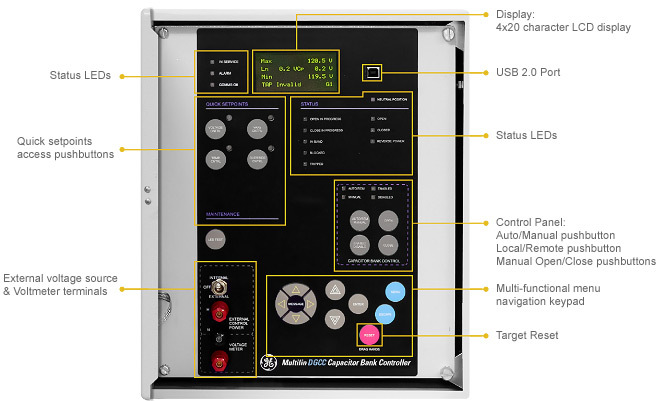 To significantly reduce time and enable more effective disturbance, post fault analysis and troubleshooting, the Multilin Capacitor Bank Controller provides an integrated event recorder and detailed diagnostic features. The Multilin Capacitor Bank Controller provides advanced disturbance diagnostic features that significantly reduce the time and costs associated with troubleshooting power system events and reconstruction. 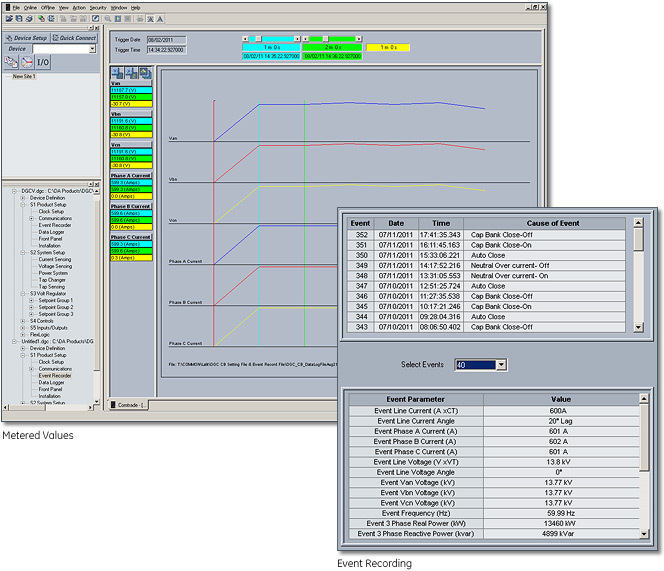 Recording functions include enhanced diagnostics with a 10 channel RMS recorder Data Logger. The Multilin Capacitor Bank Controller provides counters which records key operational parameters to aid in enabling preventative maintenance programs. 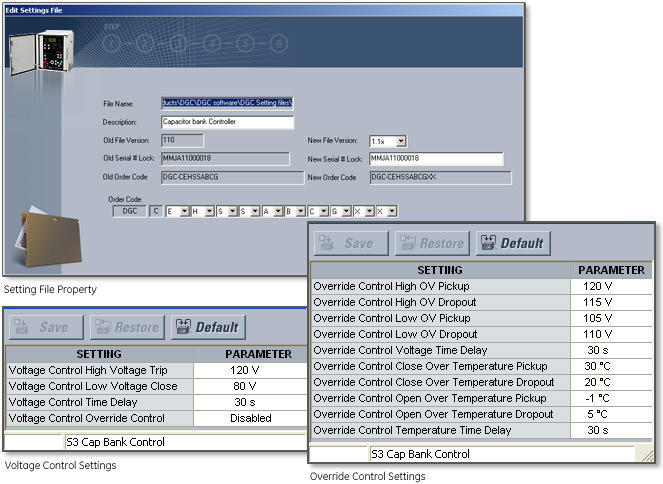 The Multilin Capacitor Bank Controller includes many counters & statistical values. Comprehensive device health diagnostic tests are performed by the Multilin Capacitor Bank Controller during startup and continuously at runtime to test its own major functions and critical hardware. These diagnostic tests monitor for conditions that could impact the Multilin Capacitor Bank Controller’s performance, evaluates the potential impact and criticality of this condition and presents the device status to operators, via SCADA and/or through the front panel display. Simplified device configuration software tool and industry leading suite of software tools to manage and maintain Multilin devices. The Multilin Capacitor Bank Controller and associated software tools provide a suite of security features that ensure only approved personnel can make changes to the configuration of the system or execute commands. These functions enable a utility to meet NERC/CIP requirements. Local Access refers to users making changes using the front USB serial port and the HMI. Remote Access refers to users making changes using the rear RS485 port.